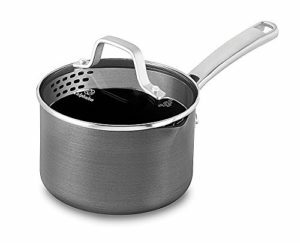 Great Everyday Pan I really like this Calphalon sauce pan…the lid is wonderful, & is very deep with a good handle. The pan has “spouts” for easy pour, & the pan is quite easy to clean. It’s lightweight, a good every day size & stores easily. Five Stars Great Pan! Love the built in strainer.